Neuroscientific breakthroughs have completely revolutionized the toy market, with decades of research leading to the development of a wide assortment of innovative brainwave toys. With unprecedented freedom and creativity leading the way, brainwave toys are changing the way we think about entertainment for the young and old alike. If you’re interested in brainwave toys, first you will have to get an MindWave Mobile EEG headset. In this post, we’re going to introduce you to the MindWave mobile headset, and then to one of our favorite brainwave toys, Puzzlebox Orbit. The MindWave Mobile headset gives you the power to utilize brainwave-sensing technology, all without leaving your own home. While the MindWave is not a brainwave toy, purchasing one is the first step toward getting started and experiencing a revolutionary new way to play. Affordable, exciting, and certain to captivate, the MindWave Mobile gives you access to well over 100 apps that have been developed for everything from checking up on your overall health and wellness, to relaxing and playing entertaining, challenging games with your friends and family. For more information on the MindWave Mobile, head over to our online store. Now that You Have the Headset, Let’s Check out our Favorite Brainwave Toy—The Puzzlebox Orbit! 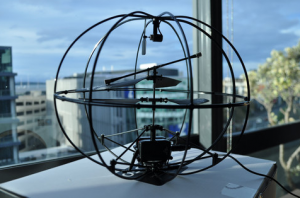 The Puzzlebox Orbit is a brain-controlled helicopter that can be flown using nothing more than your brainwaves! When wearing your MindWave Mobile headset, you’ll be able to control the Puzzlebox Orbit through focused concentration or by maintaining your state of mental relaxation. The unique design of the Puzzlebox Orbit protects its blades from accidentally making contact with walls or ceilings while you’re flying it. Not only does this design keep your helicopter safe, it’s also gives it a unique visual appeal that will help it stand out. For the more technologically-inclined, you’ll also have access to all of the Puzzlebox Orbit’s source code and hardware schematics, as well as 3D models and step-by-step building instructions, allowing you to truly customize your brainwave toys like never before. For more information on the Puzzlebox Orbit, check it out in our online store. When you begin playing with brainwave toys or games, you’ll be blown away by what you can accomplish with the power of your mind! Not only are they fun, they also make use of concentration and relaxation techniques that can be carried over into other areas of your life. While Puzzlebox Orbit may be a favorite, it is only one of the dozens of games and toys available in the NeuroSky store along side the most affordable EEG headsets on the market today, the MindWave and the MindWave Mobile! For more information on NeuroSky’s EEG headsets, be sure to browse all of the amazing brainwave toys, apps, and games in our online store.